This is possibly one of the strangest things we’ve ever seen on stage. A series of seven ‘short visual and sound events for two performers’, A Distances is hard to explain. To the sound of endless dripping water, which makes the ICA theatre feel like a shadowy cave, the audience watches various objects slide and swerve across the stage, manipulated by barely visible strings that weave around and under the space. A tiny stage on wheels full of noise and light, and operated by a complex system of strings pulled from afar, starts things off. Random cogs and arms make delicious sounds and a cold mechanical system seems to breathe. As the chapters progress, a mysterious man does odd battle with plates, stools and swinging balls. The man paints huge great self portraits. He catches a tiny projection of a person in a box and squashes him flat in a book. 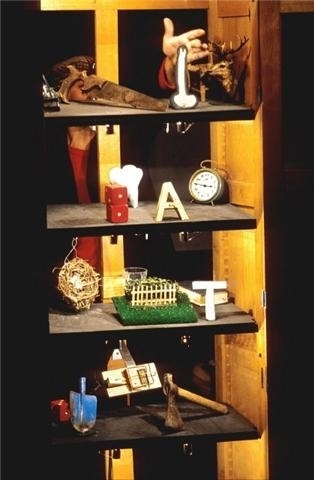 He illustrates Shakespeare with a cupboard full of phonemes and unravels time with a glass of water. He makes magic with the austere assistance of an opulently dressed woman. By the close of the final chapter, the man who started off shielding his face from the audience is addressing us directly, staring at us with his wild brown eyes and talking philosophy in a luxuriously thick French accent. He is Jean Pierre Larroche and he is brilliant in this. Larroche, and fellow performer Marion Lefebvre, create a bizarre atmosphere on stage but their work is intriguing and compelling. A Distances is a Ateliers Du Spectacle production and is part of the ongoing London International Mime Festival, which runs until the end of the month. It’s utterly odd but rather wonderful and worth catching if you have time this weekend. It’s on at the ICA until Sunday.